This film is pretty much all dialogue, and certainly not for everyone, as it is a challenging movie to fully comprehend on a first viewing, that just gets better and better as its ideas can be appreciated more on further viewings. A movie that is more about the man and his conflicts with others than it is about the products he is inventing. This film disguises itself as a movie about the inventions, telling the story in three acts with each of these acts coming at the start of a new product launch. Only we don’t see the actual product launches. Instead, we see the behind the scenes stuff. The conversations about things that aren’t working (in the first act,) about what happened to get Steve Jobs fired from Apple computers, (in the second act,) and finally about resolving some of his conflicts in the third act. There are five characters whom Jobs as conflicts with, and unfortunately three of these conflicts are about the way he is as a father. It is only the last two (the ones with Steve Wozniak and John Sculley,) that are about the product. And even then, Sculley often seems more interested in dissecting how Jobs feels about being adopted then he does talking about their jobs and industry. The movie is definitely compelling with all of it’s ongoing debate and tension, but it is all dialogue, and not quite enough about the products. Steve Jobs is an unusual movie. It is entirely the creation of screenwriter Aaron Sorkin, (based on a book about the computer entrepreneuer,) and as such, this film is not told in any traditional kind of way. Sorkin is the screenwriter who wrote A Few Good Men and The Social Network, both fantastic and unconventional films. With Jobs, he is taking his biggest gamble yet. It’s a film that is told in exactly three acts, with each one of them taking place behind the scenes of a product launch right before it happens. These acts often include flashbacks, as the characters talk about things that happened in the past, and that helps the film along without making it feel like we are trapped in these three presentation rooms. Instead, the movie goes backstage as often as possible, taking us behind the scenes to see the inner-workings of the presentations, and make it feel kind of like Birdman at times, diving in and out of hallways to catch different parts of conversations. What matters most, however, is not the style and filming technique, but the nature of the story. In this case, the nature is about a man, his products, and his conflicts with others. It makes for a pretty compelling story. 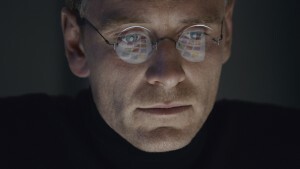 Steve Jobs, as presented here, and portrayed by a great Michael Fasbender, is a man loaded up with conflict. He’s a genius, no doubt, but for Mr. Jobs, things have not been easy. For one, he was adopted as a child, and spends a good amount of this movie, working all of that out with one of his friends. For another, Jobs is the father of a young girl named Lisa, and he is not a very good one. The mother of his daughter (he and Lisa’s mother, Chrisann, are separated,) is living with Lisa on welfare, and Jobs is a millionaire who doesn’t seem to care. Instead, his main interest regarding his daughter, at the start of the film, is to prove that she is not his, or that there is nothing conlclusive which says that she is his. He even makes a statement to Time Magazine that 28% of the men in America could be her father. When Lisa brags about how her Daddy named a computer system after her, Jobs corrects her and says it is all just a coincidence. It isn’t until she draws a picture with Mac Paint on a computer screen that Jobs actually shows some feelings for her and agrees to give Chrisann whatever money she needs for Lisa. This all happens in the first act. In fact, all three acts happen behind the scenes, just like this one. With the three structure of each one taking place at a product launch, what we surprisingly never get to see is Jobs out on stage, presenting anything to the crowd. It’s bizarre considering that the products are such an important part of this movie. But Sorkin wants to keep things completely behind the scenes. He’s also got enough on his plate as it is, with the film dealing with the problems of each new product and presentation, as well as the internal problems within Jobs’ own life. Luckily most of these problems are work related and are with colleagues. There’s only one family member who is an issue and that is Lisa. If this movie featured all different family members coming out of the woodwork to give Jobs a hard time, it would have been both ridiculous and annoying. But luckily this movie has no interest in going down that path. It knows that the reason we have come to this movie and care to be watching it is to hear about Jobs the inventor and how he came up with his ideas. And so, for the most part, that’s exactly what the movie gives us. Sure, it’s about the man, more than anything else, but it’s about the man and his interactions with others, and most of those others are people he works with. The movie starts off in 1994. Three people stand on stage looking at the screen in front of them, and trying to figure out solutions to their problem. 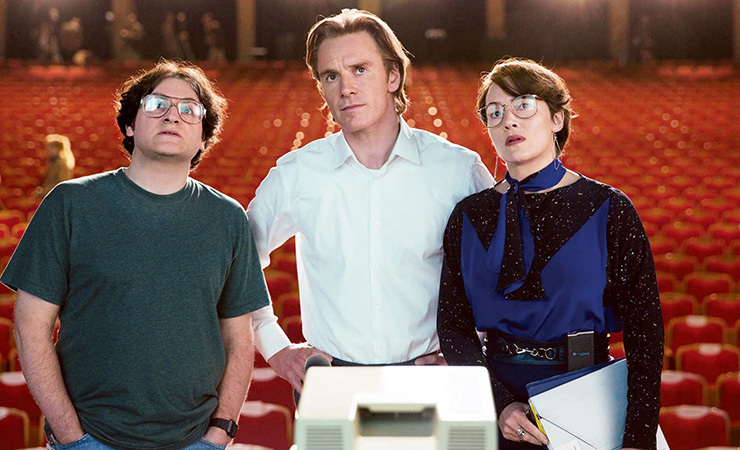 The people are Steve Jobs, Joaana Hoffman (Kate Winslet,) and Andy Hertzfeld, (Michael Stuhlbarg.) They are at the launch of the Macintosh computer, and the problem is that when the computer starts up, it is supposed to say “hello.” Only this one, that they are about to use, is not saying the message, and for Jobs it is a major problem. He tells Andy that it needs to be fixed right away if the launch is going to continue, and Andy tells him that this is impossible. Only Jobs isn’t taking no for an answer. And he’s got a lot of other things on his mind as well, including getting the EXIT signs turned off for a brief period of time, so that there is absolutely no light in the room aside from what he is projecting on the screen. Jobs walks backstage, followed by Joanna, who is the head of marketing, (but acts more like Jobs’ assistant.) That’s when all kinds of new conflicts arise, including one where Time Magazine was being considered as a hand out to everyone who attended, only it wasn’t the Macintosh on the cover. It was a different computer. At one point, Jobs and Joanne even debate the price point of the Mac. She can’t believe he has opted to sell it so low and limit it from reaching its potential of excellence in order to make it afforadbale. He explains to her that “with an airplane, coach gets on the runway at the same time as first class.” In other words, what’s important is that people can buy it, not that it is the best. This conversation, like the ones about being adopted, are very interesting, but it’s a little strange that they would be happening now, right before a product launch. I suppose those are the concessions that we, as audience members need to make, knowing that the whole movie takes place at these three launches. There will often be conversations going on that in no way took place at these locations, if they even happened at all. The movie even points this out, with Jobs saying, “why is it that right before every launch, it’s like everyone goes to the bar and decides to tell me exactly what they really think.” Not buying it. These conversations would not be happening at these times, but to tell the story of the man’s life and conflicts, and to do it at three prodcut launches, this is the only way it could have been done. There are five characters who Jobs has conflicts with throughout the movie. Each of these characters makes it into each one of the three acts, and the conflict is rehashed in each act. I say rehashed, because each act is separated by a period of years, and so each time the characters are seeing each other, it is often a matter of them having not seen each other in quite a while. Specifically I am talking about Jobs and his connection with two other characters, here. The characters are Steve Wozniak (Seth Rogen,) and John Sculley (Jeff Daniels.) Wozniak is the guy who helped create the Macintosh at the very beginning, while sitting inside of a garage just bouncing ideas around with Jobs. Now he wants Jobs to publicly acknowledge the Apple II team. Apparently the Apple II is the top selling product at Apple computers, and Wozniak wants some credit for him and his guys. Sculley doesn’t seem to have any motivation at the start of the film, other than to understand Jobs. He asks Jobs why kids who were adopted always feel like they were rejected instead of like they were chosen. It isn’t until the second act that we really understand what Sculley’s role in this whole thing is. He isn’t Jobs’ partner, but instead, he is Jobs’ competition. Between the first and second launches (or acts of the film,) we learn from news recordings that Jobs has been fired from Apple computers and that Sculley is not the CEO. In the second act, we get a flashback that fleshes some of that out. It’s here, in the second act, that we see Sculley come and speak to Jobs, and the two of them go over what took place, that led to Jobs leaving Apple computers. Everyone thinks that Sculley fired Jobs, and the truth is a lot more interesting. It all took place in an eleventh-hour, middle of the night meeting, where Sculley was about to board a plane and got a call that if he got on board, his job would no longer be there when the plane landed. Jobs was trying to get him fired. Sculley called an urgent meeting with the board, during which he and Jobs both made their cases to the board, fighting for their positions. This sequence is all the more thrilling because of the cutting back and forth with the room where Jobs and Sculley are discussing what happened, in present day at the second product launch. To make the sequence even more exciting, there is fast paced music, and also a stormy night backdrop. Rain pounds the glass all around them, and you can see shadows of the rain and lightning on the windows and skylights, both above and behind the characters. It makes for a fantastic scene. While the conflicts between Jobs and Wozniak and Jobs and Sculley are entirely work related, the ones between he and Joanna and he and Andy Herzfeld, (there are two Andys, which is a running joke throughout the film,) are both in regards to the way Jobs treats his daughter. Joanna, as played by Kate Winslet with a Polish accent, and all the emotion one could ever ask for, is bascially Jobs’ assistant (although her real title is head of marketing.) Joanna cares more about watching her boss be a decent parent than she does about her job. She talks to Jobs about how being a parent needs to be the most important thing about him. Similarly, Wozniak tells him that being decent and being creative don’t have to be separate. You can actually be both things at the same time. And Herzfeld comes into this because he has a fatherly relationship with Lisa, in many ways representing the father figure that Jobs is not. Herzfeld is the one who recommended Lisa go into therapy, gave her the name of a therapist to see, and has been paying her college tuition anytime that Jobs refuses to do so. Despite three of the five conflicts being about Lisa, (the fifth one is with Lisa, herself, and includes Jobs being upset with her for supporting her mother’s decision to sell the house that Jobs bought for them,) the movie never loses track of telling the story of Jobs the businessman right alongside the story of Jobs the father. It is Joanna, the motherly figure of the film, when it comes to the Lisa conflicts, who is the one who calls Jobs out on the second product, realizing that there is no way colleges are going to pay for the Next computer, and telling Jobs that he knew it all along. He had a plan, and his plan was to create a computer with the exact kind of operating system that Apple needed. This way Apple would have to hire him back in order to get their hands on it. Jobs intentionally held off on developing the operating system for his Next computer, so that he could see what Apple was going to need first. Two of the products of Jobs are failures and yet even before the third one, he has gotten the dream job of being the head of creativity at Apple and of having Sculley fired. This is all because he created the operating system Apple wanted. Now, he invents the third product, the IMac, and on the day of the launch, most of the conversation is about everything else. How could Andy Herzfeld be paying for Lisa’s tuition without speaking to Jobs about it first? How can Lisa have let her mother sell their house? The movie would have been improved if they spent a little more time on the products. The few scenes that do deal with them, like the need to get the exact right shark image on the screen, or an early scene where Jobs discovers that a disk fits perfectly into a dress shirt breast pocket, and reworks his entire wardrobe based on this discovery, calling out color schemas and the reasons for them, are great. The movie would have benefitted from a little more of this sort of thing. It’s a good, smart movie, and definitely the kind that gets better with each new viewing. There’s just so much to take in here, all of it coming through dialogue and jumping back in time at various points, as character rehash stories from the past. This is a complicated film, but an incredibly interesting one.